Did you know that there is a nutritious food source literally dropping from your trees each fall? Although acorns, which contain healthy fats, protein and minerals, found their way into many Native American foods and are the main ingredient of a traditional Korean jelly recipe, most people today shy away from eating them. The secret to eating – and enjoying acorns – lies in removing the tannins. When you complete this process, you can produce a subtly flavoured flour that works well in all kinds of baking recipes and even as a coffee-like beverage. 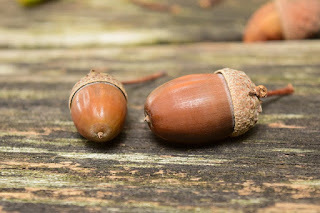 The first step to removing the tannin's is to select only ripe, brown acorns. Avoid green, blackened or mildewed acorns. Then remove the caps and boil the acorns for about 10 minutes. You will need to strain out the brown water and boil the acorns again in fresh water. Repeat this process three to four times until the water looks clear and the acorns can be easily shelled. Still another way to remove the tannin's is to remove the caps and then place the acorns inside a mesh or cheese cloth bag. After securing the opening, place the bag under running water (say, a stream) for several days. Native American used this flushing method by placing bags of acorns in running streams, rivers and even waterfalls. Now that the tannin's are removed, it is time to dry the acorns. Spread the acorns on a baking sheet and place them in a preheated 200-degree Fahrenheit oven. Leave the door slightly ajar so moisture can escape. Another option is to place the baking sheet outside in direct sunlight for several hours. Be sure to protect the nuts from wildlife while they are drying. Acorns add a nutty, slightly sweet taste to recipes. You can use them as a substitute for chickpeas, peanuts or macadamia nuts. (Put them in banana nut bread or zucchini bread!) You also can use them to make acorn butter, which you can use instead of peanut butter or almond butter. You also can add them to salads, soups and stews for flavor and nutrition. To make acorn flour, grind slightly moist leached acorns in a blender or food processor. Dry the resulting meal in a low temperature oven for a few minutes, or let the meal air dry for a few hours. Then grind the dry meal in the blender or food processor again. You can substitute this acorn flour in any recipe that uses wheat flour, but keep in mind that acorn flour products will have a crumbly texture. If you prefer a spongy texture to your cookies or bread, you will need to mix in some wheat flour with your acorn flour. Another option is make acorn coffee. Now, this drink will not perk you up in the morning since acorns do not contain caffeine, but it is a pleasant beverage, especially in cold weather. Place pieces of leached acorns on a baking sheet and roast them in the oven at 400 degrees Fahrenheit for about 30 minutes. When the pieces are dark brown in color and have a pleasant roasted (not burned) aroma, they are ready. Add one tablespoon of roasted acorn pieces per eight ounces of boiling water. Let the mixture steep for five to 10 minutes. Reheat if needed. Then you can add your regular coffee condiments or drink the acorn coffee black. Acorns are a rich source of carbohydrates, proteins, essential amino acids, trace minerals and Vitamins A and C. This nutritional value compares favourably with barley or wheat flour. Although producing acorn flour does take some time, it is satisfying to put to use a food source that is free and readily available. Just leave a few acorns for those squirrels.